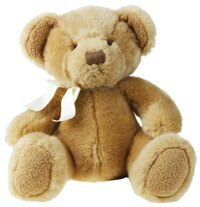 Everyone likes bears, from teddy bears to polar bears to Care Bears. You can make your own bear ears headband for a costume using just a little fake fur and some machine sewing. Making a headband of any animal ears is relatively simple. For bear ears, use fabric in brown or black (or white for a polar bear). Of course, you can also make any color of bear ears you like if, for instance, you're putting together a costume for a Care Bears outfit. Cut out four circles from the fake fur. Make the circles approximately 4 inches in diameter. This gives you enough circles to make two ears, with two fronts and two backs. Then cut off the bottom edge of the circles to make a short flat distance for the base of the ears. This should give you roughly a 2-inch bottom edge. Pin the ears together with the right (furry) sides together. Make two ears this way. Then sew around the curved edge of the ears, leaving the flat edge open. Clip the curves, and turn the ears inside out. Now you have two ears ready to be attached to a headband. Cut a rectangle out of the fake fur that is long enough to go across the top of your head and down the sides. Make it approximately 10 inches long by 4 inches wide. Lay the rectangle on top of your head, and mark where you want the ears. Cut slits about 1-12-inch slits at those locations along the center line of the headband. Squeeze the flat end of the bear ear into the slit. The fit should be tight, requiring you to slightly fold (or pleat) the ear. This will give the ear some realistic dimension, rather than being a flat circle. Sew the slit closed, catching the ear to hold it in place. Repeat with the second ear. Turn the headband over, so you are looking at the wrong side. Fold back the raw edges and machine stitch all the way around the rectangular headband, creating a neater edge. Cut out a felt rectangle the same size as the finished headband. Sew the felt onto the bottom side of the rectangle, making a neater finish to your headband. Sew on elastic or strings at the narrow ends of the headband. Either use a single piece of elastic, forming a loop across the bottom of the headband, or sew down two strings that will be tied under the chin. Follow the steps in this article to make a bear costume for a child of any size. The pattern is included!